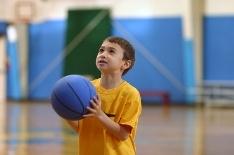 These [tag]basketball youth drills[/tag] represent “live game” situations. We use this [tag]basketball shooting drill[/tag] to find the players who can make their free throws late in a game. I put a [tag]basketball[/tag] at each free throw line. Have the players line up at one of the baskets. The first player sprints to the basketball, shoots a free throw, gets his rebound and replaces the ball at the line. Then he sprints to the next basket and repeats this [tag]basketball drill[/tag] at every basket. As soon the first player replaces the ball at the 1st basket, the next player goes until all the players have taken a turn. The 2nd time around the players need to keep track of how many free throws they make.